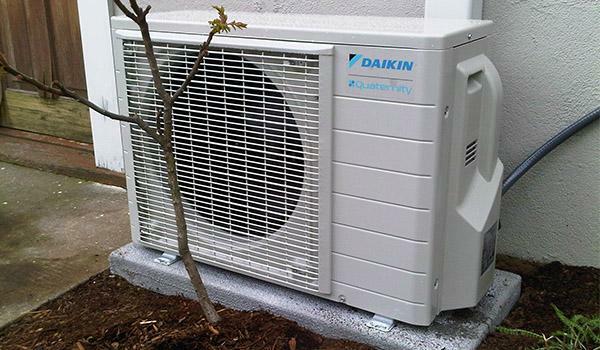 Advanced Air Systems, Inc. is a NW Ductless Heat Pump Project Master Installer and certified Daikin 3D Dealer. We are also part of the Clark Public Utilities Contractor Network, providing products and services eligible for Clark Public Utilities rebates and incentives. 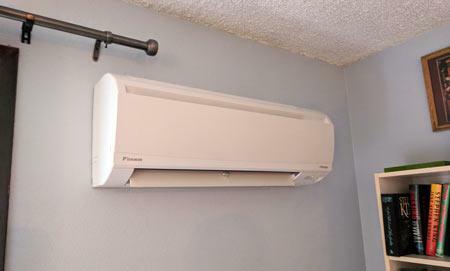 We offer affordable ductless heat pump system installations with a strong focus on quality work and excellent service. Ductless mini-split heat pump systems are a low-cost, super energy-efficient alternative to the conventional ducted heating system. They work well for many applications such as replacing electric baseboard, wall heaters or woodstoves, homes with ducts in poor condition, room additions and new construction. The great thing about using a ductless heat pump to heat and cool your home is the simplicity of the system. A ductless heat pump system consists of three separate components: the outdoor heat pump, indoor fan unit and remote control thermostat. The outdoor compressor unit is smaller and quieter than most conventional heat pumps. And when we say quiet, we mean just that; it is almost unbelievable how little noise comes from this unit. However, we do have one set up in our showroom, so you can hear it first hand! The heat pump is connected to the indoor unit by a small bundle of cables that are neatly concealed within a vinyl cover when exposed outdoors. The indoor part of a ductless mini-split heat pump system is also very quiet and although is it strategically placed within the home to allow for maximum coverage, it is small and close to the ceiling which allows it to blend in quite nicely in a variety of situations. 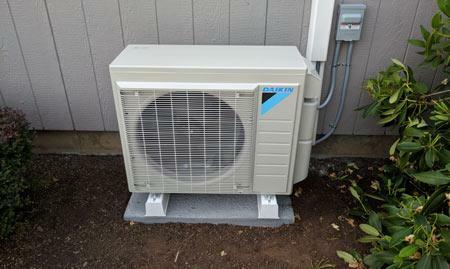 Advanced Air Systems, Inc. is a third-generation heating and air conditioning contractor who has been proudly serving Vancouver, WA and the surrounding area for over 20 years. We are licensed, bonded and insured and strictly adhere to local codes and best practices when serving our customers. We are highly trained and knowledgeable in our field, but the most important thing that you will notice from the very first time you call our office that our greatest strength is the fantastic staff in our office and in the field that truly care about the work we do. We understand that to find success in business is to build long-term relationships with customers who are so happy with our service that they are comfortable recommending us to friends and family. Please feel free to check our credentials with the Better Business Bureau, Angie’s List or your local utilities. We are on Clark Public Utilities trusted contractor list and a certified contractor through NW Natural Gas. With spring in the air, summer is just around the corner. And if you are dreading those high temperatures and electrical bills, it may be time to consider a Heat Pump for your cooling needs. Despite the name, heat pumps are an excellent way to cool a house because they operate just like an air conditioner, except that a heat pump is able to provide heating and cooling in all but the most extreme weather conditions. Because these units contain a valve, the refrigerant runs in both directions moving heat from inside to outside as well as outside to in. With a heat pump, the system can be zoned with incredible precision. Each wall unit contains its own discrete refrigerant line that runs to the outside unit and allows each room its own zone. Each wall unit contains a thermostat allowing for a different temperature. These systems can be installed in places where ducts are not an option, and the high efficiency reduces energy costs. How to Determine If a Heat Pump Is Right for You? If you currently have a ducted system, then a heat pump may not be the appropriate choice. A ducted heat pump may suit your needs better. But if you live in a place such as a condo, where ducts are unsuitable or unavailable, you may want to consult with a cassette heat pump contractor. Before your heat pump installation, our Advanced Air Systems HVAC specialist will need to evaluate your individual requirements. Our specialist will determine the number of wall units and the location of refrigerant lines. They will also complete a heat loss and gain analysis to determine the necessary size of the units needed. Once the specifications have been determined and the necessary parts obtained, we can begin your heat pump installation.